With Readly you can read FIRE&FOOD (EN) and thousands of other magazines on your tablet and smartphone. Get access to all with just one subscription. New releases and back issues – all included. 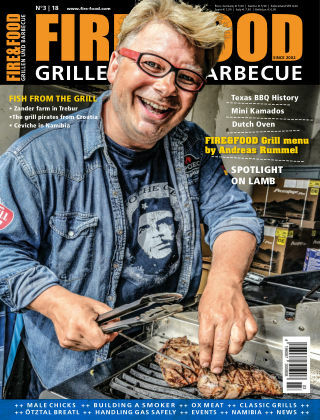 FIRE&FOOD has been Europe's number one trend magazine for everything to do with grilling, barbecues and outdoor cooking for more than 15 years. The most important ingredients for this success are passion and enthusiasm. Because the creators of FIRE&FOOD at the Elmar Fetscher publishing company have one thing in common: Grilling and eating is a big part of their life! This passion for culinary pleasure leads to ideas for unusual reports from all over the world, in which international grilling and barbecue experts present their finest recipes. Tried out (of course), always successful - and completely delicious. You will also find remarkable insights and perspectives of a fascinating world in every issue. The focus is on both professional meat and cutting knowledge and details of traditional preparation methods. Comprehensive accessory and product testing, informative service topics and reports about grilling and barbecue events in Germany and abroad provide the right “seasoning”. FIRE&FOOD is the magazine for anyone who likes to enjoy their food in a relaxed yet sophisticated way. People who like cooking outdoors - be it in their spare time or for professional reasons. This includes people who grill for a hobby and ambitious barbecue enthusiasts with their variety of grilling equipment, barbecue ovens and smokers, fans of so-called “black pots” and butchers, kitchen chefs and caterers who expand their offerings with barbecues and obtain specialist knowledge, tips and suggestions from FIRE &FOOD. The resulting readership is a demanding and coveted target group for brand advertising!